Another day another ferry and this time we landed on Krk. 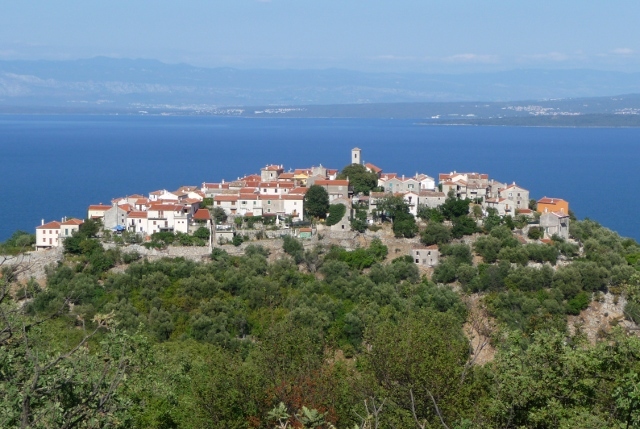 Like Rab it’s another of the Kvarner Gulf islands, the biggest one, and a stepping stone to the next island of Cres (pronounced ‘stress’), and thence to the mainland again. We were really only intending to overnight on Krk, see a little bit of the island and then head to Cres which sounded more attractive, more things to see. When the hour and a half-ish half-empty ferry docked at Krk, we headed straight for Krk town itself and Camping Bor, a slightly smaller family run site. It was larger that a lot that we’ve been on but we found a wooded glade tucked away at the back of the site where we managed to squeeze the van between the trees to a good shady spot. The joys of a small van that you can get into shady places while the bigger ones cook in all-day direct sunlight. It’s now very hot – not complaining – but the 35ish Celsius temperatures can be a challenge, sapping one of energy not least. We were also delighted to find they had a reasonably priced washing machine so some laundry was done. Due to this, plus finally getting our Bosnian blog posts done, we ended up spending an extra night there, aiming to see the town the next day. We had been spoiled by Rab town, so picturesque and with its medieval fare it was a real draw. Krk town was disappointing after that. A quiet place, not too touristy, with some lovely buildings and alley ways. Somehow it didn’t have anything memorable to it, apart from the striking pink Cathedral of the Assumption of the Blessed Virgin Mary whose angel, according to the town’s tourist brochure, had been replaced several times over the years with the latest version made of “polyester”, a 1973 replacement. Other than that there were some fortified towers, but no real town square that we could find. We felt duty bound to try the local delicacy – a hearty homemade pasta and goulash dish called šurlice. A bit too heavy for a lunchtime in high summer, but worked very well as a dish to share with a salad on the side. The hot weather is driving us to drink lots of cold beer at every opportunity, and Radler, the local version of shandy, is a refreshing and low alcohol alternative and a daily staple to help cope with the heat. 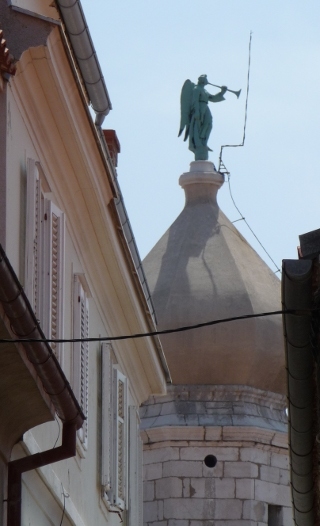 Before leaving Krk, we had to visit the town of Vrbnik. Famous for its white wine, we passed through the vineyards before reaching the town sitting above turquoise seas on the other side of the island. A wander round narrow streets and we were lured by signs to a winetasting room hidden down a narrow alley behind arches. A good refreshing tasting later, and we left with a plastic water bottle full of the draft white. Further exploring led us to an outside seating area above a rocky cove. Azure water below (I’m running out of adjectives! ), and high stools by tables made out of barrels. Thirsty? Yes – a carafe of Vrbnik white, a huge bottle of sparkling mineral water and a plate of local ham and cheese with olive oil and bread for dipping… mmm… an early lunch doesn’t get much better than this. Oh and would we have a drink on the house … smokvarica and travarica (fig and herb brandies)? We wouldn’t say no would we? We arrived at the ferry port for our boat to Cres thinking that we had plenty of time as we thought we had just missed one. Something must have gone wrong with the scheduling as we were on a ferry almost straightaway and heading for Cres. 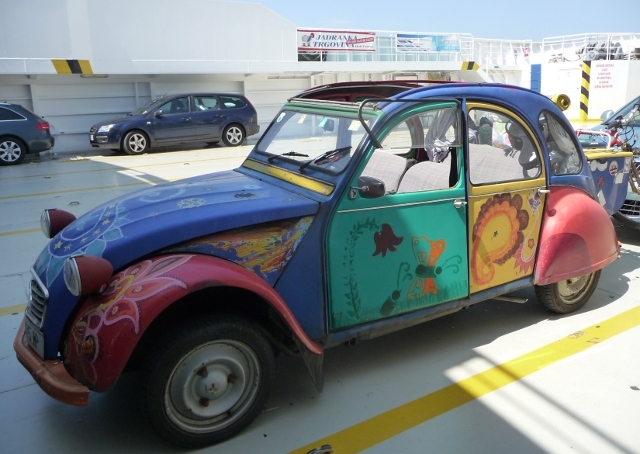 One delight of the short hop, was spotting a handpainted Austrian 2cv with paisley patterns on its bonnet and doors – very colourful and must have been a tight fit for the family of four (with teenagers) that climbed into it as we docked and received our admiration for their car. 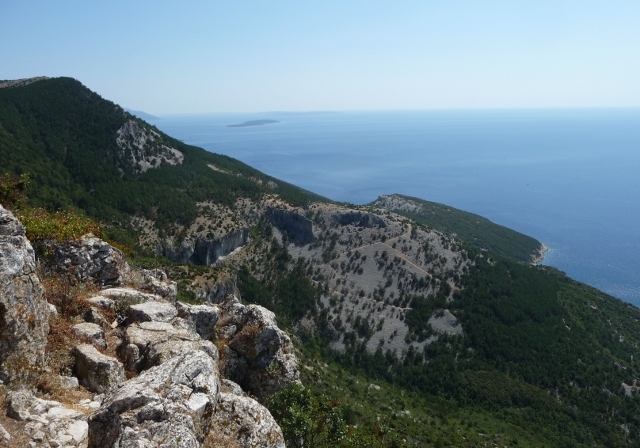 The first impression of Cres was that it was more mountainous than either Rab or Krk. It was covered in mediterranean maquis greenery and stonewalls, and there was a steep climb from the small ferry dock up the hill, drivers vying for first place to beat the camper vans up. Not minding blind bends and brows for their overtakes. Cres is a long island and we had arrived along the north-east stretch. Losinj is the island to the south, artificially separated by a channel probably built by the Romans and linked by a bridge. We decided to head south and work our way back up to the north west where we would catch the ferry to the mainland. We settled in though, and ate an early leftovers dinner, and then walked the kilometre or two into the town with its harbour backed by colourful painted houses and a church behind. We caught the last of the evening light and found intriguing alleys to wander up. Behind the touristic restaurant and bar lined promenade, the town had a real life carrying on up the hillside. We had a special offer g&t at a bar, watching the hordes of people on the front, before slowly wandering back to our campsite. Next morning, we had a wonderful peaceful early swim in the sea below the site which had been heaving with people the afternoon and evening before. A seabird was floating on the sea next to me, diving down to catch his breakfast. 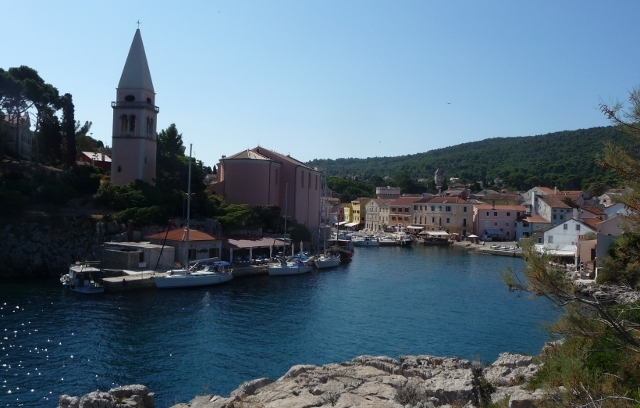 We headed first to Veli Losinj, its colourful houses crowding a small harbour – this could be Cornwall, only hotter and more cicadas. Further north where the two islands meet is Osor. A small stone village, not quite sleepy, but amazingly not touristy. It had archeological work going on at what had been a monastery, a church or two. It prided itself on its music and had many music-related scultures. And a gallery showing an exhibition of cartoons from a competition – all related to islands and holidays. Some hilarious thinking and witty visual descriptions. Lubenice was next on our itinerary as we continued up through Cres, but it took a little bit of finding. Our maps are quite small print and my eye-sight is ageing which sometimes leads to some interesting detours. The small road I thought went there didn’t. We should have turned off. We turned around, and found the road via the tiny hamlet of Grmov above Lake Vrana. But a sign after the village said ‘Ne Lubenice’. Not Lubenice. There’s offroading and offroading. We could have tried it anyway, but turned around and headed back, pulling in for a view of the lake far below (the lake is above sea level and is deeper than the sea). As we did so, we saw some of the other inhabitants of the island soaring high above. Griffon vultures. We took out our handy binoculars and peered at the sky. White heads, golden brown upper plumage as they caught the sunlight – darker towards their lower bodies and wings. Wingspan. Wow – we were awed as we watched a couple of them searching out carrion on the hillside below before they disappeared from view. So we went the long way round to Lubenice, which means watermelons in Croatian, and it was worth every kilometre. We passed the other end of the track that had come from Grmov. Some people with a 4×4 were parked in the road by the turning, looking rather anxiously underneath their vehicle. We’d made the right decision not to continue along that route. Lubenice is a stone hill top village high above the (azure) sea, which boasts a small café and after following signs, a konoba. We had paid the modest parking fee on entering the village and had pulled up outside the church, which houses the café. No shady tables though. 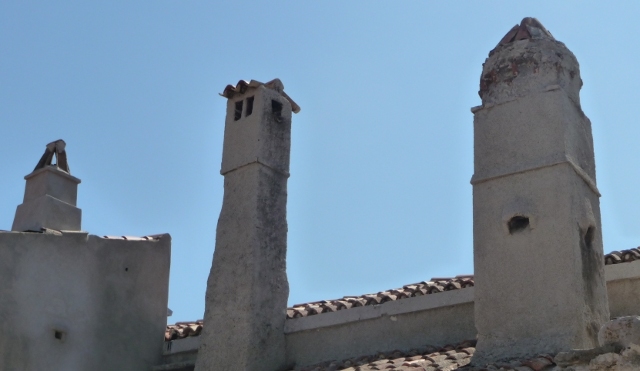 We started our wander through the village – captivated by its charming old buildings. We found the Konoba Hibernica and looked at the menu. A risotto for Adrian and I fancied the lamb’s liver and polenta starter. It arrived on a groaning plate. Delicious but a little more than a lunch snack. Still we wouldn’t need to cook dinner now. We spent a while looking out at the views and exploring the nooks and crannies of this captivating place, before heading on, picking up a couple of Austrian hitch-hikers who needed dropping on the way. The next place was Cres town itself. Our Austrians had said it was ok. It was. OK. Nothing special in the by now mid-afternoon lull. 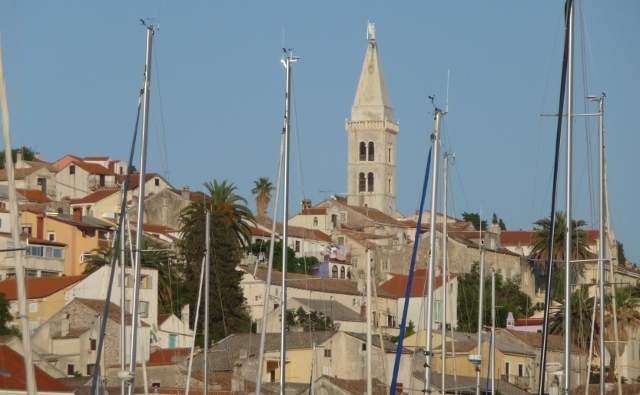 Another harbour town, rather down-at-heel seeming after the Losinj towns. And then on to our proposed stop for the night, at Beli on the north-east of the island where there was a small campsite. 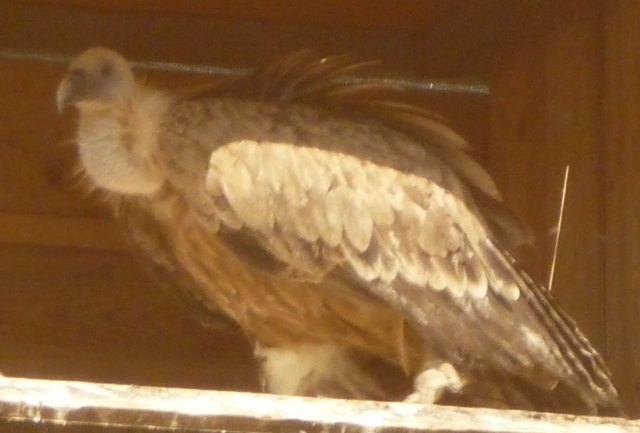 And a Griffon vulture sanctuary. The lane up there wound around the edge of the mountain, narrow, and on-coming trucks kept coming, so quite scary after a while, and locals tended not to want to back up for tourist campervans to get past them. Anyway, after a few kilometres we spotted the village, on a raised ridge, again high above the sea below, and spotted the busy cove where the campsite would be. It was a steep narrow downhill. Probably not many ‘fridge-freezer’ style vans there then. It was a small, basic site which looked crammed and scruffy, set behind the beach front. Not a lot of choice. Eventually we opted for the squeeze into the middle of the best bit amongst lots of other campers option. We don’t like it when people camp too close to us so I was slightly uncomfortable with this, but everyone was really friendly and I assured them it was just for one night. Hot, dusty and tired, we had chatted briefly to an English family camped nearby who advised us to take the short walk to another cove for our swim. The beach was still rather busy and a walk over the rocky hillside to another cove was appealing. It was wonderful, there was just a handful of people there, and we had the sea to ourselves. Heavenly. The best way to cool off after a full day. We didn’t need to cook of course because we’d had a big lunch. By the campsite there was a beach shack bar and we had to have a beer there, which meant we saw them frying little fish, not the Gerice we’ve had before, but a different and slightly larger species. They smelled and looked too good to pass up. We could share a portion. And another one. Yet another resolution gloriously discarded as we watched the moon’s reflection glimmering on the sea beside us. Very early next morning, we strolled back to our cove over the rocks, and swam from there to the next tiny cove. The sea was quite wavy so it was quite a work out and as we were the only ones around, we opted for a costumeless swim. Very liberating and invigorating. The plan was to head onwards, reluctantly, back to the mainland. On looking at the map a few days previously, it looked to make sense to go to Slovenia before finishing Croatia. So we had set a date with our Slovenian friends to meet up the following weekend. That meant that we had to press on quite quickly. After a few weeks where we’ve dawdled, we’re now in full travel and pack as much into each day as we can mode. We sadly said goodbye to the lovely German family we’d camped beside who’d been practicing their English – our apologies for long forgotten German – and back up the steep narrow hill only meeting traffic coming the other way right at the top. We had a quick wander round Beli, meeting a ninety year old woman who apologised in English for her lack of English as the only other language she knew was Italian. She spoke about the village – it’s a hard life there especially as so many people have left to seek employment elsewhere. The same old story as so many places across Europe. Then to the Griffon vulture centre on the outskirts of the village. The English woman who greeted us at reception had started there as a volunteer last year only to remain as a permanent member of staff. The vultures there are those rescued around the area who have been found sick or injured, some are released back into the wild, others wouldn’t cope so remain at the centre. It was feeding time at 9.30. We arrived at 9.29 – perfect. We passed through the rest of the centre quite quickly and into the viewing area within the vulture enclosure. There they were on their nesting ‘cliff’ at one end. A dead sheep was neatly placed in front of the viewing area. The centre has its own flock of sheep for this purpose. We waited for the vultures to come down and feed. They were obviously not hungry, as we waited and waited. There was some flexing of wings, some pecking of each other, a couple flew to a platform. But no one came to eat. We couldn’t stay any longer. It was lovely to see them up close. I never would have thought that I would feel affection towards a vulture, but they are unexpectedly endearing. So it was back towards the ferry, up the side of the hill. As we came towards the top of the central ridge again, we saw several birds circling above. We pulled into the layby at the junction and gazed in awe as several vultures dipped and hovered over a patch of hillside before all disappeared – evidently some tasty dead thing was there for the taking. Beautiful creatures, their survival endangered because of the drop in sheep farming, fewer dead sheep to feed on, not so much other carrion. Everything has a knock-on effect. We feel privileged to have seen them free flying above us. And so to the ferry and back to the mainland to discover the region of Istria. 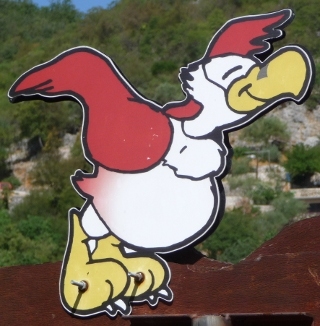 This entry was posted in By Country - Croatia, Food stuff, Personal stuff, Travel stuff, Wildlife stuff. Bookmark the permalink.